But no one talks about war crimes, crimes against humanity, 4 wars going on, economic ballout that never trickled down, stimulus package that never stimulated, and various other things that these upcoming candidates will do, the same. They cannot point at what they intend to do once in office. A single voice for impeachment??? Never. When Obama said moving forward, that meant that he would not bring charges against the Bush Administration, cleared the trail so he would not be held accountable. He has continued the Bush policies and some, and that is the real issue. I find it ironic, that in this here Land of the Free, home of the Slave, that everyone does not have the privilege to become president, cause they were not born here. That law let’s everyone in the whole world know, that you better be born here, no matter how much you do in the community, no matter how many times you made the effort to change this here USA into a better place. So check yourself at the door, if you ain’t born here, you might as well forget it, brother/sister. You don’t make the grade. There is something extremely insidious about this so called patriotic edict, that is only for the chosen few. And how many people does that kick out of the race? When this whole birther thing came out, I just SMDH, because nobody would address how elitist/sexist/racist this clause is. Again, they throw their distractions at us, folks gobble it up and then sit back and feel good or mad, because he proved it. If he is worthy, if anyone is worthy, why do they have to prove they were born here after giving their lives for this country(ie Hispanic/Latino/African,etc. veterans can’t run cause they were not born here. You can apply for citizenship, but you can never be President). I don’t get it, well, yes I do, that is to keep you and me out of the ball game if we ain’t got the papers, the contract, the monetized document that says….. “You are now a ward of the State.” and don’t you try to act like you are independent, we own you. 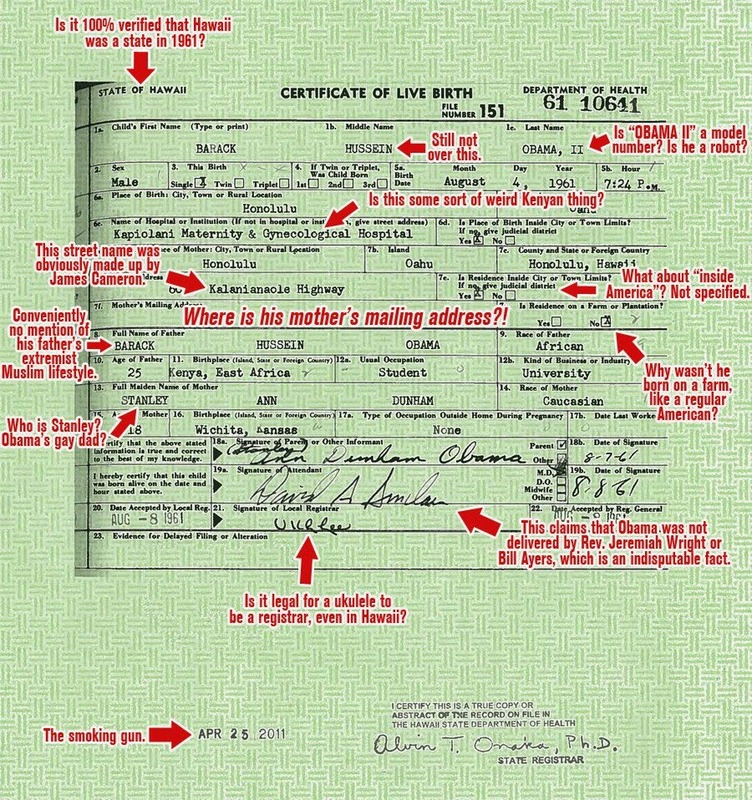 That is all this proves to me, is that he is owned, like everyone else who has a “Birth Certificate.” We are all certified slaves to a system that will trade our human resource on the open market, give us another number and get richer and richer and richer…… off our backs. Ha, break it down for what it really means.